As fate would have it, I woke up one morning last week to discover that the 60 year old oak tree in my front yard had split almost right down the middle and was hanging together by a thread. This was very depressing because my family loves this tree. It was one of the first things that we would see in the mornings and one of the last things we would see in the sunset. I had taken many portraits in front of it and now, sadly, it would have to be cut down. After calling 5 different tree removal companies in Atlanta, I was surprised that I was not getting any call backs. Don't these companies want my money? By pure luck I was driving home when I saw R&L Tree Experts working in a nearby neighborhood. I asked them to give me a quote and they came early that evening. Their estimate was fair, and they were willing to do the work the very next day. This was great because the tree was very unstable and could have easily fallen on my house. They did a great job the next morning, and I even had them remove some humongous pines that were dangerously leaning over my house. 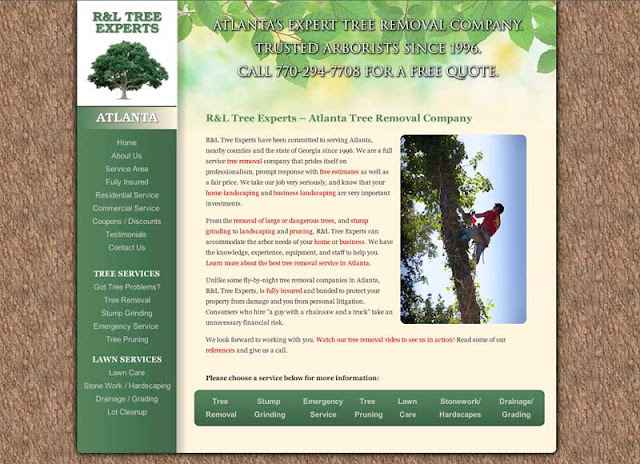 I would recommend R&L Tree Experts to anybody in the Atlanta area who needs tree removal service. Talking to the owner, Romel, I found out that they did not have a web site and I offered to make them one. These guys had built their business on word-of-mouth and referrals only, but it was time to modernize. These guys were genuinely nice people, and I really wanted to help them. Part of the design project was to take photos of them performing various tree removal duties. I also wanted to make a simple time-lapse movie showing them removing a tree. We helped them with the marketing of the site by writing the text and came up with a final web site that I think will serve them well in the Atlanta market. 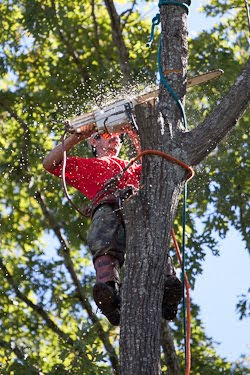 You can check it out at www.RLTreeExperts.com.